While at the dawn of ecommerce, personal approach to customers was more widely used in case of the B2B segment, now it is equally vital for all types of relations. Therefore, such modules as Shipping & Payment By Customer Groups by Amasty become crucial for both B2B and B2C clients. 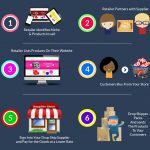 If you also want to provide a better shopping experience for your clients, check the following post. 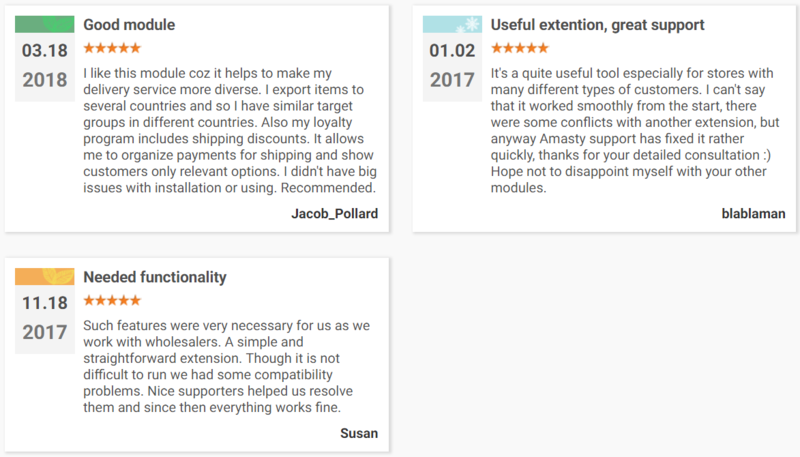 Below, we shed light on how to provide advanced Magento 2 shipping rules and better Magento 2 payment methods basing on customer group segmentation in no time at all. Show only available shipping and payment methods. The mentioned above features dramatically increase the usability of your Magento 2 ecommerce storefront. Imagine a situation when you cannot hide payment or shipping methods that are not available in the country of your potential buyers. 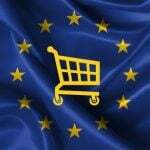 When a visitor from this country tries to get the shopping done and selects the unsupported options – nothing happens. As a result, the order is not complete, and you lose not only the cost of the order but also a new client who can become a returning customer. Furthermore, you will get a negative reputation among a customer’s friends: word of mouth is a powerful weapon, so never use it against yourself. To solve the problem, you have to communicate with the buyer informing him or her that the chosen methods are not available. Magento payment methods per customer group become inevitable, of course, if you want to provide a stunning shopping experience. Magento special shipping group is a good idea as well. Here is another use case. Often, ecommerce stores have some VIP customers, and to emphasize their importance you can provide some exclusive services. In case of the default Magento 2 platform, it is impossible, but, after installing the Amasty Shipping & Payment By Customer Groups Magento 2 extension, you can easily achieve this goal and at the same time fix the mentioned problem. Provide exclusive Magento 2 payment options and only available shipping methods avoiding headaches caused by the default limitations. 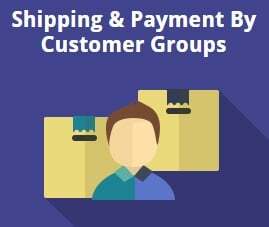 The Amasty Shipping & Payment By Customer Groups Magento 2 module works in two ways: first of all, you create an unlimited number of customer groups and for each shipping and payment method select a group that will be able to use it on the checkout page. A reversed algorithm is possible as well. Magento customer groups payment methods (shipping as well) can be denied or allowed for the specified groups, which is especially handy when you have lots of them. Note that the Amasty Shipping & Payment By Customer Groups Magento 2 extension can be utilized as a reliable marketing instrument. We’ve already mentioned above that it is possible to provide better shipping and payment options to VIP buyers with the help of the module, but who are these buyers? First of all, we are talking about all loyal customers: leverage the extension to make them even more devoted to your brand. Perhaps, you work with wholesalers, so they can also get privileges. At the same time, the Amasty Shipping & Payment By Customer Groups Magento 2 module can be used as a new motivator for store visitors to log in or register. In combination with Magento 2 customer group pricing, this feature works brilliantly! Simply hide free shipping from unregistered visitors, but don’t forget to inform them about its availability for logged in customers. Note that the module treats all customers who don’t belong to any group as ones from the NOT_LOGGED_IN group. Therefore, you should assign them to specific groups to get the most out of the module. Now, let’s explore the backend section of the extension. The Amasty Shipping & Payment By Customer Groups for Magento 2 has a very intuitive backend interface split between two sections: Payment Methods and Shipping Methods. Let’s explore each one. To configure your payment methods visibility, go to System -> Amasty Shipping/Payment Methods Access -> Payment Methods. Here, you can see two sections: Scopes and Payment Methods. In Scopes, select a website to display payment methods on. As for the Payment Methods section, you can specify actions for selected groups – allow or deny each payment method. Next, it is necessary to choose customer groups to apply limitations or privileges (depending o the chosen action). Press the CTRL button to select several customer groups. The section with shipping methods is based on the same principle. Being available under System -> Amasty Shipping/Payment Methods Access -> Shipping Methods, it allows you to select a current scope (to which website to apply the new configuration), choose an action for selected groups, and specify customer groups for each of the available Magento 2 shipping methods. Admin scope was added to the list of websites for payment and shipping methods visibility. Reverse logic was added. Now it is possible to either deny or allow methods for the selected customer groups. The feature can be handy for cases with a significant amount of customer groups. This option also gives you more flexibility when setting up the visibility of a method, as well as improves the workflow for site admins.